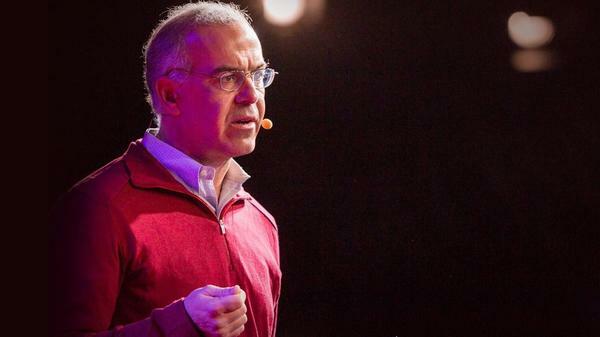 David Brooks: Can You Become A Better Person By Confronting Your Worst Self? Part 5 of the TED Radio Hour episode A Better You. New York Times Columnist David Brooks says success alone isn't enough to build character, or even achieve happiness. He says those come from struggling for something bigger than yourself. David Brooks is a New York Times Op-Ed columnist and author of, The Road to Character, a #1 New York Times bestseller. Brooks also teaches at Yale University and is a member of the American Academy of Arts & Sciences. So I just asked Matt Cutts this question - and I'm curious to get your take on it - which is do you think that self-improvement is innate? Like, as humans, do you think that we all want to become better? DAVID BROOKS: I think people are innately curious. They get around something, and they they just want to learn about it. RAZ: This is New York Times columnist David Brooks. BROOKS: And there's a sense that some people - wise people - they have an inner peace that you hunger for. Or some people - they radiate a moral inner light. They're just incandescent inside, and they're joyful. And so you often see people who are doing life better than you (laughter). And you see them - and I often think, you know, I've achieved more career success than I ever thought I would. But I don't have that. So I'd like to have that. RAZ: For a while now, David has been searching for that. You can call it inner peace or inner light or just character, which is the term he landed on for his recent book. BROOKS: You know, I wrote this book called "Road To Character" about people who are innerly searching. And some of them is super sappy and super sentimental - George Eliot deeply in love, Dorothy Day struggling with her inner demons. And, sometimes, I'd go to these meetings in a conference room. And I'd go to talk about my book. And there'd be a bunch of middle-aged, white guys. And I thought, OK, I'm going before this audience of CFOs. And I'm going to tell them about George Eliot's love life. And then when I would start talking, there would be a quality of silence such as I've never heard as people begin to lock in. And even the most superficial and the most boring people (laughter) seemingly have this hunger. They have a hunger for true joy and true fulfillment. Everyone feels this. It's somehow baked into our souls. RAZ: But this raises a question. If we all desperately want to feel fulfilled, what's stopping us from seeking that out? Well, for David, part of the answer is that we spend far too much time focused on values like ambition and success and too little time on values like honesty, compassion and kindness. Here's David Brooks on the TED stage. BROOKS: So I've been thinking about that problem. And a thinker who's helped me think about is a guy named Joseph Soloveitchik who's a rabbi who wrote a book called "The Lonely Man Of Faith" in 1965. Soloveitchik said there are two sides of our natures, which he called Adam one and Adam two. Adam one is the worldly, ambitious, external side of our nature. Adam two is the humble side of our nature. Adam one asks how things work. Adam two asks why we're here. Adam one's motto is success. Adam two's motto is love, redemption and return. And the tricky thing I'd say about these two sides of our nature is they work by different logics. The external logic is an economic logic. Input leads to output. Risk leads to reward. The internal side of our nature is a moral logic and often an inverse logic. You have to give to receive. You have to conquer desire to get what you want. In order to fulfill yourself, you have to forget yourself. In order to find yourself, you have to lose yourself. RAZ: I mean, when you think about the two Adams, do you think that you've always placed more weight and importance on that second version? BROOKS: I think so. I wonder - if I was 22, I might think, well, you know, getting that one thing - getting that career right is pretty important. But I'm not 22 anymore. So I do think that Adam two getting the inner resources right, getting the heart right, getting the soul right is the more important thing. And I can tell you I've achieved more career success, more recognition. I've got a better job than I ever thought I would. And the central lie of American life is that success leads to happiness. And that's just not true. And that only comes through spiritual depth and spiritual peace. That only comes from struggle towards some moral ideal. RAZ: Yeah. And happiness is definitely a struggle, right? I mean, like, for most of us, it's something we have to work hard at. BROOKS: Yeah. I've come to dislike happiness. BROOKS: And partly as a word - I mean, I do think happiness is - somebody said there are four levels of happiness. First, material pleasures. Two, status, becoming success. Three, generativity, which is the pleasure you get from giving back. And fourth is transcendence, the joy you feel when you're connected and serving a universal love, universal ideal, universal truth. And moving from one and two to three and four seems to be moving beyond what we call happiness toward joy or fulfillment or purpose. You know, if you asked me about the most important times in my life or anybody the most important times, it's rarely the happy times. It's the times when you're struggling for some ideal. And that sort of defies happiness, but it points more toward fulfillment. BROOKS: I was reminded of a common response through history of how you build a depth of character. Through history, people have gone back into their own pasts, sometimes to a precious time in their life, to their childhood. And, often, the mind gravitates in the past to a moment of shame, something committed, some act of selfishness, a lack of courage. Adam one is built by building on your strengths. Adam two is built by fighting your weaknesses. You go into yourself, you find the sin which you've committed over and again through your life, your signature sin out of which the others emerge. And you fight that sin, and you wrestle with that sin. And out of that wrestling - that suffering - then, a depth of character is constructed. And we're often not taught to recognize the sin in ourselves. And we're not taught in this culture how to wrestle with it, how to confront it and how to combat it. RAZ: Do you remember a point in your life where you thought, I need to change this about who I am? BROOKS: Yeah. I think that all the time (laughter). You know, I've got my list of core sins, a tendency toward glibness and shallowness, a fear of having unpleasant conversations. And then, like a lot of people, I struggle against selfishness all the time. And David Foster Wallace in that famous Kenyon commencement address - we see the world from the vantage point of me. Everything's in front of me, behind me, back of me. And we just have an innate selfishness. And so one struggles with that continually. RAZ: I'm wondering if you ever have this experience which is - you know, like, on this show, we just did an episode on altruism and then another on forgiveness and one about compassion and kindness. You know, and working on all these shows, I think a lot of people assume that I, then, embody all of these traits. But, you know, I can be unkind. I can be unforgiving. And I think about this a lot - that there's this kind of disconnect between what I talk about on the show and how I sometimes behave in my personal life. Do you know what I mean? Does that happen to you? BROOKS: Welcome to my world. Yeah, my joke after writing this book was that writing a book on character doesn't give you character. BROOKS: And reading a book on character doesn't give good character. But buying a book on character gives you good character. BROOKS: And, you know, I do think the learning is important. You have to know with intentionality - like if forgiveness - you have to have some thoughts about what forgiveness is. But just knowing it is not enough. We all know what to do a lot of the time. But that doesn't mean I know it. It has to be followed up with two other faculties. One is loving it enough to actually do it, to be motivated to do it. And then having sort of a moral yearning - that even if it's not pleasant, you're still going to do the thing because you believe that it's right. And learning that depth of love and that depth of passion is what we need to really propel us and motivate us to do good. RAZ: So how do you do it? Do you have a daily practice? Is it books? Is it literature? What is it? BROOKS: It's two things. One, I have decided that I'm going to risk being earnest. And I'm going to err on that side. And, sometimes, I'll go over the line and be insufferable. But the world needs a little earnestness 'cause there's a lot of cynicism, snarkiness. So I'm going to risk that. But, secondly, the - I think the solution for a lot of us is what I call a galaxy of warm places - that, every week, you have a regular set of people you meet with where the dominant mode is not ideas and intellect. It's emotion. I have come to not believe that character is built internally through an inner drama with self, though that's part of it. It's built externally by making commitments to things - to a spouse or family, to a philosophy or faith, to a community and to a vocation. And how well we choose those things and execute those things determines the fulfillment of our lives. RAZ: That's author and New York Times columnist David Brooks. You can see all of his talks at ted.com. Thanks. DAFT PUNK: (Singing) Work it. Make it. Do it - makes us harder, better, faster, stronger. RAZ: Hey. Thanks for listening to our show, A Better You, this week. It's our 100th episode. And we've got lots of cool stuff online to celebrate 100 episodes of the TED Radio Hour. So please, please check out our Facebook page and follow us on Twitter. It's @TEDRadioHour. If you want to go back and hear the other 99 episodes of TED Radio Hour, you can find them at ted.npr.org. And to see hundreds more TED talks, check out ted.com or the TED app. Our production staff at NPR includes Jeff Rogers, Sanaz Meshkinpour, Jinae West, Neva Grant, Rund Abdelfatah, Casey Herman and Rachel Faulkner with help from Thomas Lu and Daniel Shukin. Our intern is Tony Liu. Our partners at TED are Chris Anderson, Colin Helms, Anna Phelan and Janet Lee. I'm Guy Raz. And you've been listening to ideas worth spreading right here on the TED Radio Hour. DAFT PUNK: (Singing) Work it harder. Make it better. Do it faster - makes us stronger. More than ever - hour after. Our work is never over. Transcript provided by NPR, Copyright NPR.